Submitted by Alexander Briones on Jun. 13, 2018. Originally published on May 11, 2017 written by Denise Azucena and last updated on Jun 13, 2018. As part of our June 2018 update we've expanded this guide to include smaller mic kits in addition to 7 mic kits. We made this change because although 7 mics are the minimum you need to properly mic a standard 5-piece drum set, many of our readers already have some mics and don't need a full 7 mic set. You may also want to take a look at our guide to The Best Overhead Mics For Drums which focuses on matched pairs for the best stereo imaging as well as our guide to The Best Dynamic Mics which are great at handling the high SPLs of drums. 89 out of 100. Incorporating 100+ ratings and reviews. The DMK-7 drum microphone kit includes four dynamic mics, one kick drum mic, and two condenser mics. The DM70 dynamic mics included in this kit have a cardioid pattern that allows close miking and prevents bleed-through from other parts of the drum set. They can also handle up to 140dB SPL which helps in recording the loudest drums without distortion. The DM80 kick drum mic has a neodymium element which delivers maximum output and has a rubber shockmount mic holder that minimizes floor vibration pick-up. The two CM88 condenser mics are 9-52V phantom powered and have an extended frequency response for transparent and smooth sound reproduction. In their customer and user reviews, a number of people mentioned the microphones from this kit have a solid feel and weight to them since they have a rubber isolation jacket around them. A lot of them said it's a good entry-level kit for its price. 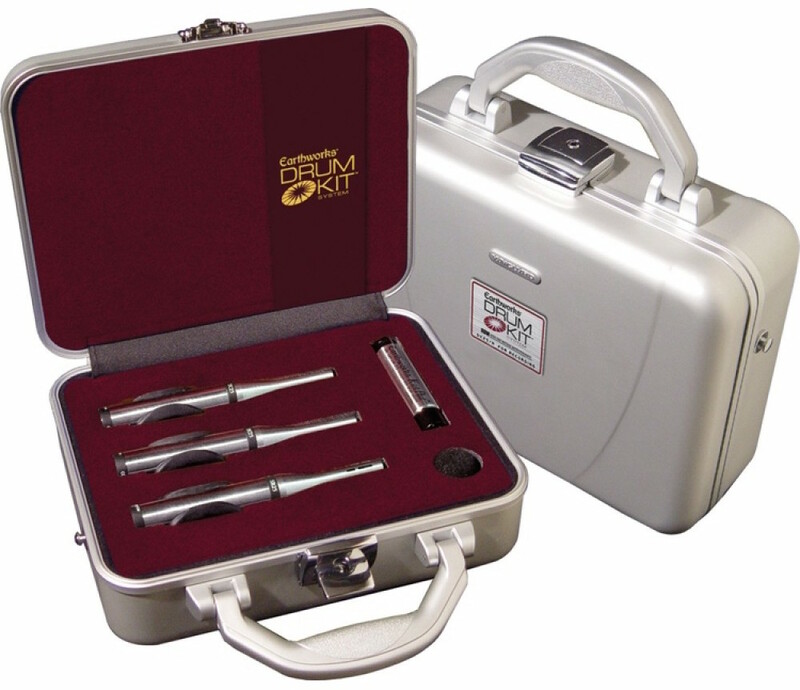 Other than drums, this kit has flexibility in providing decent recording for other instruments. Many users said these microphones provided good recording results. They also mentioned the DM70 microphones were the highlight of this kit since they bring out great tonality of toms and snare sounds. There are a few who feel that the kick drum mic does not fully capture the body and depth of their kick sound, while some expressed concern with the reliability of the mic mounts. This kit is a good choice if you want affordable durable microphones that get the job done when it comes to recording drums. 89 out of 100. Incorporating 50+ ratings and reviews. This bundle from CAD Audio features a complete set of drum mics, with 5 dynamic mics and 2 condenser mics for miking each piece of your kit. The D19 snare mic has a supercardioid polar pattern with a frequency response of 90Hz -14KHz (-6dB). The three D29 tom mics have the same cardioid polar pattern, but tweaked to better capture the sound of toms with its 90Hz -13KHz frequency response. In the same manner, the low end emphasis of kick drum is captured by the D10 kick mic since it is tuned to 50Hz -16KHz. Finally, the Stage7 bundle comes with two condenser microphones that can be set up as overhead mics for the cymbals, with extra sensitivity to higher frequencies. Each mic comes with drum mount clips while the condenser overhead mics come with a roll-off pad. Microphones: 3 x D29 Dynamic Tom Mics, 1 x D19 Snare Mic, 1 x D10 Dynamic Kick Mic, 2 x C9 Overhead Condenser Mics. Value for money seems to be its most applauded trait, with many describing the CAD Audio STAGE7 as the best bundle for the price. Even those who find fault with its sound still report that they are getting their money's worth, if not more. Sound and build quality also gets a lot of thumbs up. There are a few reports of the mics moving as they play due to the quality of the clips, while some users complain about the quality of the bundled bags. 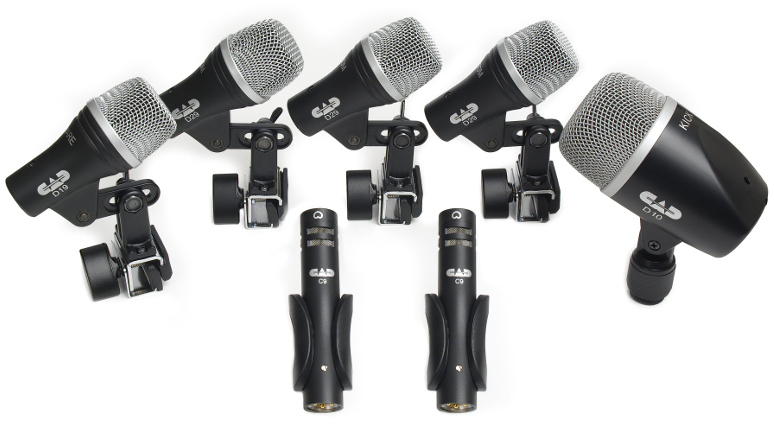 If you're looking for a good low-budget 7-piece drum mic set then do check out the CAD Audio STAGE7. 92 out of 100. Incorporating 20+ ratings and reviews. At the time of publication, this had the highest ratings for any 7 mic kit. 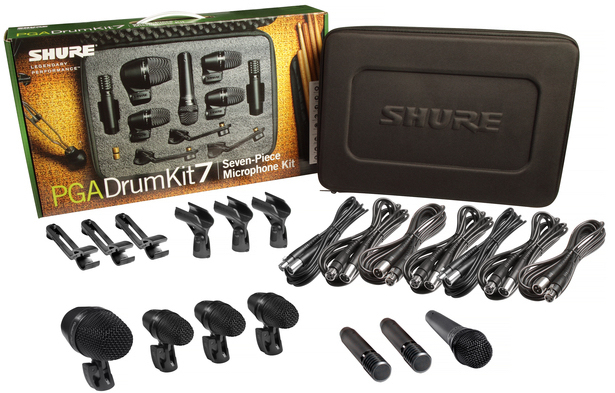 Shure are one of the biggest names in microphones and they've priced the PGADRUMKIT7 for the home recording market. This kit includes their PG Alta series that have a sleek black metallic industrial design and cardioid polar patterns that reduce background noise and feedback. It includes one PGA52 and three PGA56 drum microphones along with one PGA57 and two PGA81 instrument microphones. The PGA52 is a dynamic kick drum mic designed mainly for the kick drum and for low-frequency recording and performing applications. The PGA56s are dynamic snare and tom microphone made for close-miking percussion applications. The PGA57 is a dynamic cardioid microphone that recreates acoustic drum performance and recording while the two PGA81 are condenser cardioid microphones used for sensitive acoustic instrument recording and performance. This kit also comes with stand adapters, drum mount clips and XLR cables. 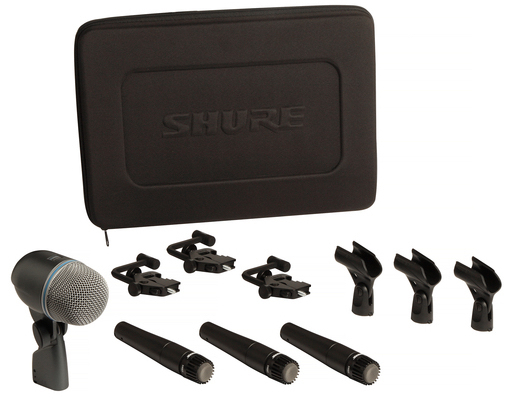 Many reviewers gave positive reviews for the microphones' quality and the kit's price overall. The microphones in this kit have a clear and flat response. A lot of people used the PGA81 and got great recordings when they used them for overheads. Some users said this is a great starter kit since it's easy to set up with the provided mounts and cables. Many achieved great results when they used this in both live settings and in studio recordings. Miguel Monroy said in his Modern Drummer review that they tested the PGA56 tom mic on maple toms. He said whether they were "playing heavy, thunderous tom patterns or light, articulate fills, the PGA56 captured everything flawlessly. They also delivered a true, accurate representation of the toms." Multiple experts concluded the PGA57 has a mid- to low-frequency extended response compared to the Shure SM57. There were no consistently reported complaints. In the sub $500 price range this kit provides the best microphones that are great for both live settings and studio recordings, and other accessories that complete your whole set up. The microphones on this kit have a clear and flat response, and are able to capture the subtleties of your drum kit in live performances or recording. 88 out of 100. Incorporating 50+ ratings and reviews. The Audix FP7 drum mic package is a definite step-up from the options above. 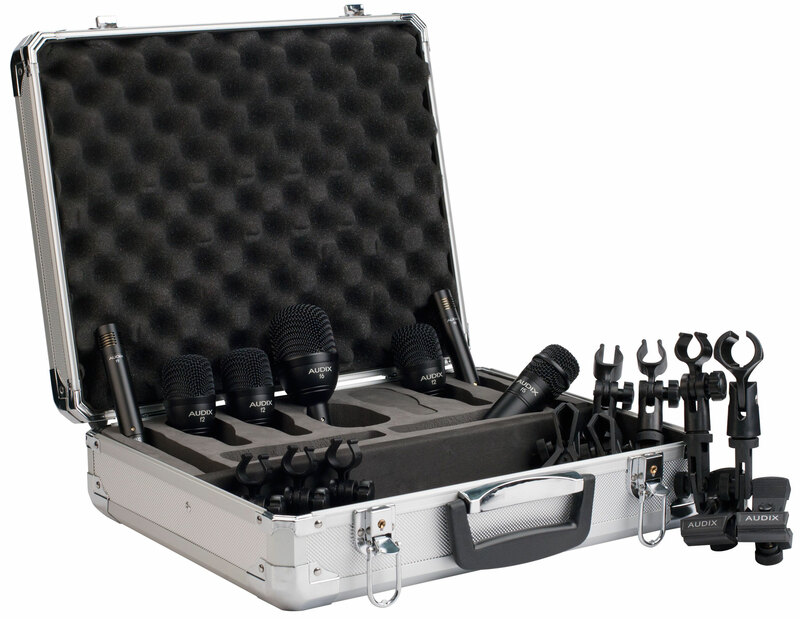 This kit contains the following microphones from Audix's Fusion series: f2, f5 and f6 dynamic microphones and f9 condenser mics. The three f2s are designed for rack and floor toms and are also used for brass, woodwind and other percussion instruments such as congas, djembe, bongos, and timbales. The f5 is an instrument mic with a hypercardioid pick-up pattern that helps minimize feedback. It's designed for snare drums but it's also useful for timbales, bongos, guitar cabinets and acoustic instruments. The f6 dynamic instrument mic is designed for kick drum, bass cabinets, cajon and other low frequency instruments. This kit also contains two f9 all-purpose pencil condenser mics made for overheads and distance miking. A lot of users found this kit to be a great deal in terms of quality and budget. These users mentioned the microphones were easy to set up and produced natural sounds while recording their drum kits. Some mentioned this is a good starter kit for those who want to use these mics in a studio setting. Some praised the f9 overhead mics for picking up great recordings. Some reviewers used the f9 as a hi-hat mic and it still performed well. The f2 and f5 mics provided tight sound recordings. Richard Alan Salz, audio engineer and owner of Vermont Audio Labs tested out the f2 microphones on his toms and mentioned in his review that the "toms sounded punchy and fat; they were better than average when it came to rejecting leakage." In his Modern Drummer review, Mark Parsons compared the Audix D6 with the f6 kick drum mic and said it was "still in the “pre-equalizedconcert-ready” neighborhood of the D6, but it had a bit more midrange punch, and the fundamental resonance was at a slightly higher frequency." Both experts and users agree that there's very little EQ needed to get a good drum mix when they used this kit overall. Some users found the kit's drum mount clips felt less sturdy and more restricting than they liked. Some also mentioned they felt a bit flimsy and not as durable as they wanted. Despite the drum mount clips feeling a bit less sturdy than some liked, the microphones on this kit are of exceptional quality that provide natural sound recordings of drums. 89 out of 100. Incorporating 10+ ratings and reviews. 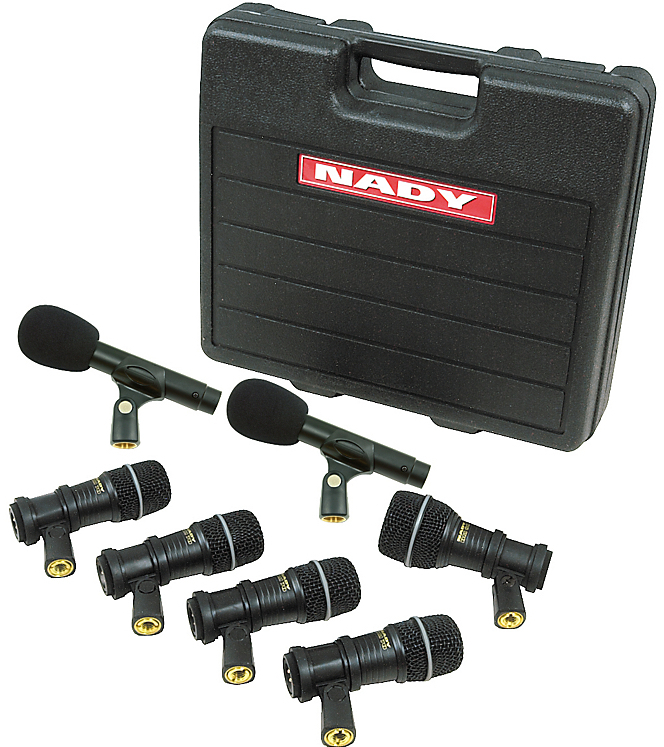 Nady is known for affordable gear, so its not surprising at all to find them offering a good value five drum mic bundle. But the Nady DMK-5 is not just about value because for the price, it continues to get rave reviews. This package comes with 4 cardioid pattern mics that are meant for miking snares, toms and other percussion instruments. These mics feature neodymium element for high SPL handling. The fifth mic, the DM80, is meant for the kick drum, having similar features but fine tuned for handling lower frequencies. Note that you'll need a separate overhead condenser mic for the cymbals, but given the price of the Nady DMK-5, it gives you more room for other gear. Market response to the Nady DMK-5 is overwhelmingly good, impressing even experienced drummers. While value for money is really where it excels, there are many who are satisfied with its how it captures even the loudest of their hits, making them viable for live performances. Other percussionists also chime in with their commendations, reporting that it works well with cajons, congas, bongos and more. While it is great at handling loud playing, there are some users who feel that some of the nuances of their playing are lost, especially when playing at lower volumes. There are also some drummers who report having a hard time getting a softer sound from the mics. 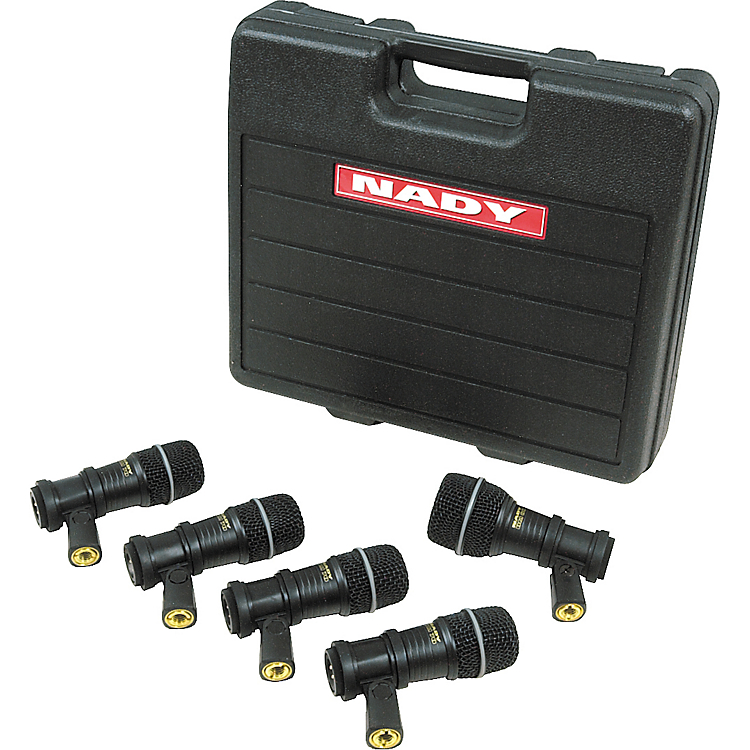 If you're in the market for a budget friendly drum mic kit, then do check the Nady DMK-5 out. 89 out of 100. Incorporating 20+ ratings and reviews. Shure is well known for their road worthy dynamic vocal and instrument mics, including drum mikes. The PGADRUMKIT5 is a bundle of five mics, first of which is a PGA52 kick mic which is fine tuned to handle the punchy sound and harsh lows of a kick drum. There are also three PGA56 mics that are designed to better handle the frequencies of toms, and are versatile enough to work with other percussion instruments. Last but not the least is the Shure PGA57 mic, with its ability to handle the high sound pressure levels of snare. 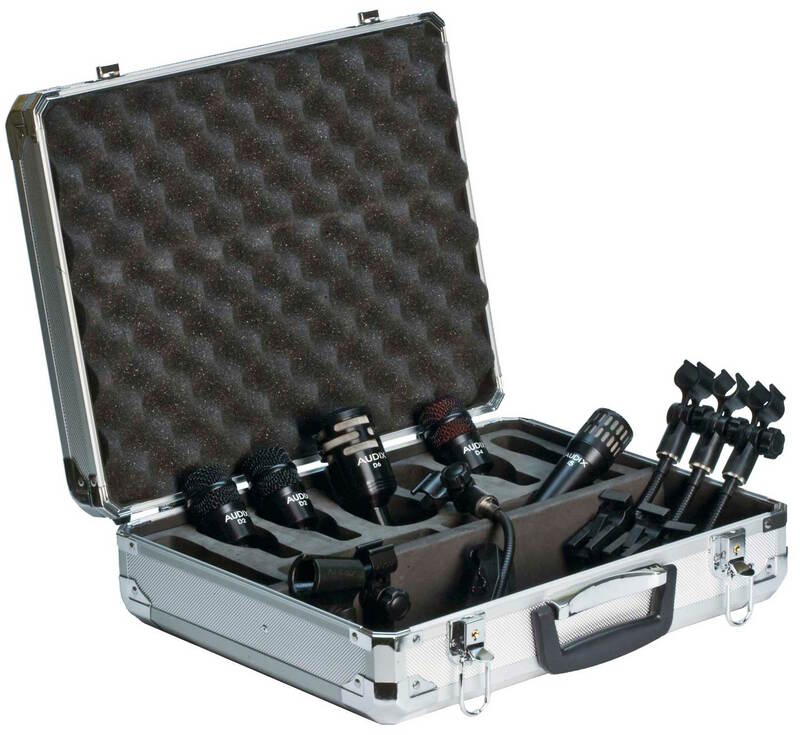 It also comes with the necessary tools for setup, including mounts, clips and even XLR cables - all of which are packed inside a road worthy case. Based on reviews, build quality seems to be the standout feature, but there are also many reviewers who commend this bundle for its sound quality. The snare mic in particular, caught the attention of many reviewers, with how it handles both soft and loud playing. Noise rejection also gets a good number of comments, which makes this microphone package easier to manage on the mixing board. There are a few users who felt that the sound was too flat. To that effect, some recommend doing EQ adjustments before judging its performance, to get the most out of this mic kit. 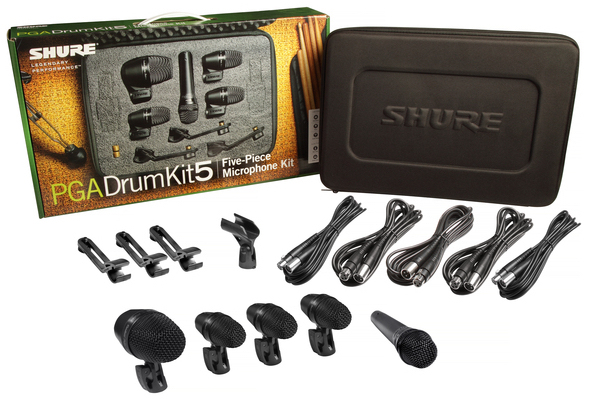 With its consistent high ratings, and big brand backing, the Shure PGADrum kit5 is highly recommended in this price range. The Audix Fusion FP5 drum microphone set is a five-mic bundle meant for conventional drum setups, with dedicated dynamic hypercardioid mics for the kick, snare, and three mics for each toms. The biggest of the mics is the F6, with 40Hz-16kHz frequency response especially tuned for kick drums. The F2 mics for the toms have a frequency response of 55Hz-15kHz, while the F5 snare mic's frequency response is at 55Hz-15kHz. There are some retailers that market the FP5 as a versatile drum kit, with some even recommending the Audix F6 mic for use with guitar cabinets. All these mics are packed in an aluminum case along with four drum clips and one mic clip. Most users commend the Audix FP5 set for its great live sound, while others recommend it for its versatility and value for money. There are also reports of it working well with other instruments like djembe and bongos, some even use it for miking guitar amps. There are a few users who complain about the size of the drum clips, wishing that they were more discrete. If you're looking for a drum mic package that can be backup mics for other instruments, then check out the Audix FP5. 91 out of 100. Incorporating 70+ ratings and reviews. At the time of publication, this had the highest ratings for any 5 mic kit. As the price of drum mics increase, the more specialized the contents of the package are. Case in point is the Audix DP5A which features a dedicated mic for the floor tom and a premium mic for the snare. While all three tom mics are dynamic hypercardioid, the D4 floor tom mic can handle more lows with its 40Hz-18kHz frequency response, compared to the 68Hz-18kHz response of the two D2 tom mics. The D6 kick drum mic's frequency response is 30Hz-15kHz and it has a cardioid polar pattern. Finally, the Audix i5 dynamic cardioid mic handles the snare with its 50Hz-16kHz response. 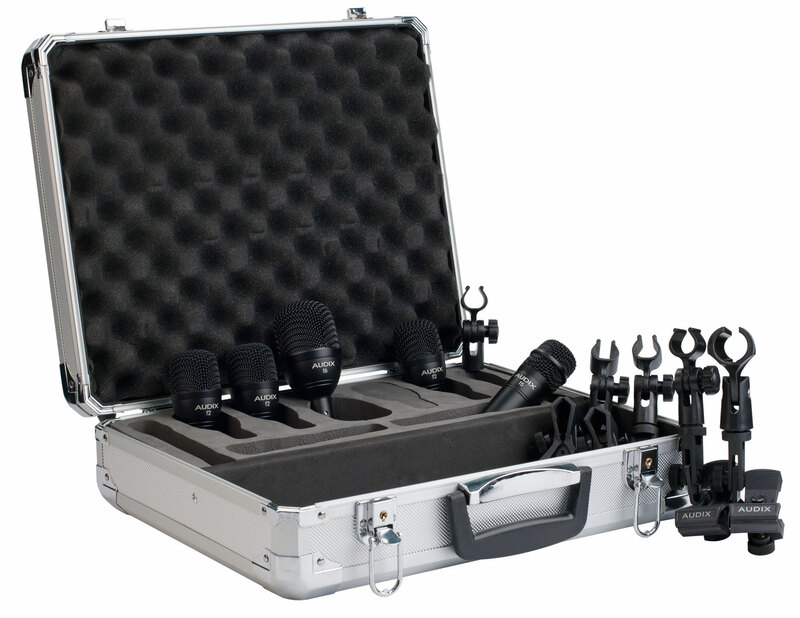 Rounding up this mic package are four D-Vice gooseneck clips and an aluminum case that holds it all together. This microphone package gets most of its commendations from drummers who are satisfied with its overall sound. The i5 snare mic in particular gets a lot of positive mentions, along with the D4 floor tom. Some even report that it sounds so good out of the box, there was no need for any EQ. Drummers also report that because of its good dynamic range, it's not limited to specific musical/playing styles. Other than a few who feel that the price is outside their budget, there aren't any noteworthy complaints. If you are looking for a drum mic package that captures more of the nuances of your acoustic drum kit and your playing, then check out the DP5A from Audix. 89 out of 100. Incorporating 200+ ratings and reviews. The Shure DMK57-52 brings together many of their popular mics in a drum mic package that can also be considered as a good all-around stage mic package. At its core are three Shure SM57 mics, widely considered as an industry standard on many instruments, including the snare. For this package, these SM57s are meant for use with the snare and toms, but their reputation means that they can be used with virtually any sound source, including loud guitar and bass amps. The fourth mic in this package is a Shure Beta 52A with built-in drum mount, it serves as the kick drum mic with its good low-end handling. The package also includes three drum mounts for the SM57s, and a carrying case. Market sentiment continues to be favorable for the Shure DMK57, which is expected since the both the Shure SM57 and Shure Beta 52A are both market favorites. It is commended for a variety of reasons, from its good sound quality, to its time tested reliability, also for their versatility, which translates to good value for money. Many recommend this drum mic set for start up studios. While the mics themselves are almost perfect in terms of ratings, there are a few who are not too happy with the bundled mic mounts. If you're not sure what to get, the Shure DMK57 is your safest bet, highly recommended. The Sabian Sound Kit is a three piece mic kit that comes with its own compact mixer, something that other manufacturers don't offer. This three-channel personal drum mixer has a dedicated channel for capturing the kick drum via the included SK1 mic. The other two channels are for capturing everything else via two SOH2 overhead mics. The mixer also lets you monitor your sound via headphones through its 3.5mm and 1/4" jack outputs. 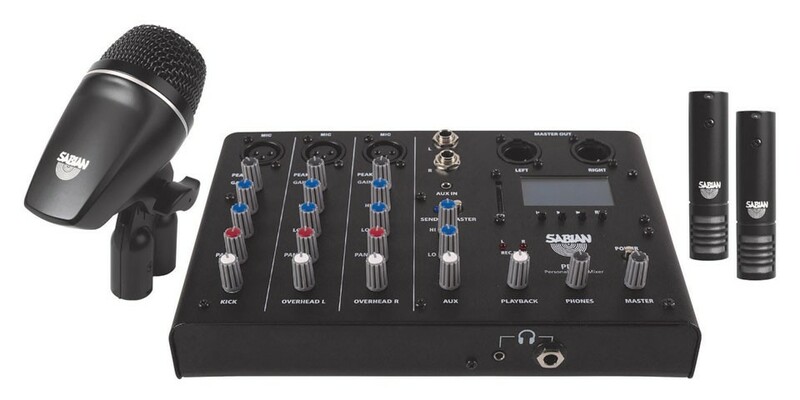 Its combination of easy setup, intuitive mixer control and good value for money makes the Sabian Sound Kit appealing to drummers and home recording studios. It continues to exceed the expectations of many, even those who expect it to have an average sound quality are pleasantly surprised with the improved recording quality that they get. While it is meant to capture the entire drum kit along with ambient sounds, there are some who have gotten good results by combining this bundle with close proximity drum microphones. Stuart Williams of Music Radar gave the Sabian Sound Kit a perfect review score, and he writes that it is "a fantastic set". Since the overhead mics are small diaphragm condensers, they are prone to catching ambient noise, limiting its use to rooms with good acoustics. If you're looking for an affordable and easy to use method of miking your drum kit, then we highly recommend the Sabian Sound Kit. 92 out of 100. Incorporating 175+ ratings and reviews. Unlike other sets which feature different mics, this 3-pack bundle features three Sennheiser e 604 microphones and drum clips for attaching the mic to the snare or toms. With its high sound pressure handling (over 160dB), this dynamic cardioid mic is designed specifically for use with loud instruments like snare and toms. But its not just about handling loud sound sources because it has good enough sound quality to impress wind instrument players. Sennheiser equipped this mic with a lightweight voice coil which allows for quick transient response, while its fiber glass body ensures durability for long term use. Adjectives "great" and "excellent" are just two of the many positive comments that reviewers use to describe the Sennheiser e 604. Ease of positioning comes in close second, with users reporting that they are able to get the mics to their sweet spots. There are a few who report that that it doesn't work well with floor toms. Get the Sennheiser e 604 kit and you'll find many uses for them. 87 out of 100. Incorporating 5+ ratings and reviews. The Earthworks DK25/R offers a different approach to miking drums, instead of going with the usual 5 to 7 mic setup, it comes with a simplified setup of two overhead microphones and one kickpad mic. Interestingly, this seemingly simplified setup, captures more details than conventional miking, thanks to the two overhead TC25 omnidirectional condenser mics, which captures the sound of the drum kit along with the natural air and reverb of the room. This makes it a simple yet effective mic setup for recording acoustic drum kits. Supporting the two overhead mics is the SR25 condenser microphone with in-line kick pad adapter, especially designed to handle the low-end punch of kick drums. The downside to this setup is the lack of control for individual drum parts when mixing, and it can't be used when recording a full band or in a noisy room. Reviews are consistently good, with many praising this set for the clarity and overall cohesiveness of the resulting sound. The simplicity of its setup is also another plus, along with the versatility of the overhead mics, which can be used to record multiple instruments or singers. There are also some users who mix the Earthworks DK25/R with close proximity mics to achieve even better results. This bundle suffers from the same limitation as other omnidirectional mics do - it captures every sound in the room, including unwanted sound. This means that it won't be of particular use for those without acoustically treated recording rooms, and they aren't viable for live use. Its premium price tag also factors in, it is not as affordable as many would like it to be. If you are looking to step up the quality of your drum recordings and you're ready to make a bigger investment, then check out the Earthworks DK25/R. It's more affordable, to some extent, to get a drum microphone kit over buying individual drum microphones, because they include important accessories like mounting clips and cases. Many of these drum mics can also be useful for vocals and other instruments, adding to their usefulness. While most close proximity drum mics are dynamic, there are also condenser type mics used, especially those that are positioned overhead. Dynamic microphones are ideally used on the snare, toms, and kick drum since they offer a good mid-range frequency response and have a sturdy build to withstand occasional miss-hit. They also tend to be pre-EQ’d to make each miked drums sound better. Condenser microphones usually come in a pair and are often used as overheads or room mics to capture the wide frequency range of the cymbals and ambience of the room. Additional accessories make drum microphone kits more convenient. Most of them come with drum mounts, which are integrated clamps that enable you to fasten the microphones directly to a drum. 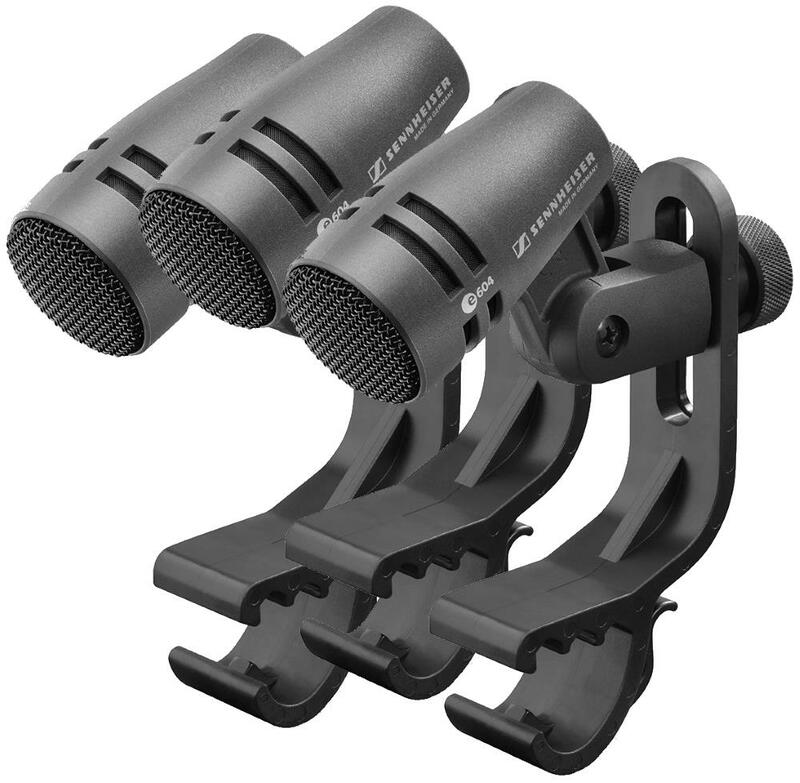 These mounts enable you to "close mic" a drum, and are attached to the edges, rims and other applicable surfaces. Some have stands that are useful for mounting kick or tom microphones. Another common component included in drum mics are carrying cases, which make storage and transport more convenient. There are some bundles that include XLR cables, but in case you need them, you can see what we recommend in our XLR Cable Guide. Dynamic microphones are the go to mic used in live settings because they can handle large sound pressure levels, they have good noise background noise rejection, and are less prone to feedback. There are instances, mainly in large venues, where condenser microphones are used to achieve better detail live performances. In the studio, close miking each drum component with dynamic mics give you more control over each drum part, which is important in the production process. On the other hand, overhead omni-directional condenser mics give you a complete picture of the drum sound, with minimal setup time. The downside to this setup is that it is more prone to background noise, and you don't have individual control over the sound of each drum part. For this update, we decided to cover even more drum mic sets regardless of the number of mics that are included. This expanded our short list to 26 drum mic kits (most of which you can see in the Music Gear Database) that are readily available from major American music gear retailers. To further narrow them down, we gathered the most current and relevant reviews, ratings, recommendations, and forum discussions, which tallied to over 1,700 sources. We then processed all this information with the Gearank Algorithm to produce the scores out of 100 you see above. We then categorized the mic kits according to the number of mics that they have, and featured the best rated ones for each category. For more information about this process see How Gearank Works. Submitted by Jason Horton on Jun. 13, 2018. Submitted by Jason Horton on Jan. 22, 2019.